I am very intrigued and inspired by the idea that the members of a family can work together to create a viable economy for their household. My wife and kids and I are working on an “experiment” of this kind right now. The main thing that started the gears turning along these lines was that we began thinking about the example in Acts chapter 2 and Acts chapter 4. Why do we limit that sort of idea to an idealistic picture of what the church should be? Wouldn’t it be just as viable in a Christian family? The more we thought about it, the more we realized that we didn’t have a good answer for “why not.” So we took the plunge. One of the things we noticed as we started discussing things was that the way we have typically gone about handling our children’s income (from jobs, babysitting, allowance, etc.) hasn’t trained them very well what life is like in the “real” economic world. What adult do you know who has 80% to 90% of their income available to do whatever they like with it? Maybe only the extremely wealthy – which is NOT you and me. That’s NOT the real world. The money we earn goes to pay bills, provide food and other necessities, and to save for the proverbial rainy day. If there is expendable income, it’s a very small percentage. Yet, most parents allow their children’s income to be governed by the first model. They might be required to tithe 10% and then maybe save 10%, and the other 80% is left up to the child’s discretion. How does that prepare them for financial management in the real world? It doesn’t. We had a family meeting to discuss the financial needs of the family as a whole. We made it a family affair, not just a responsibility of the parents. We allowed for 15% of what our children earn to go to them, like a “thank you” for doing a good job for the sake of the family. At the time of this writing, we’ve been operating according to this model for almost 7 months, and everyone has continued with the same giving attitude as when we began. In my opinion, this model not only benefits the entire family financially, it also teaches all of us some valuable lessons about life. Life IS about more than us. Yet we are able to make a significant difference in important ways (no matter our age or earning ability). We learn that our money is not really OUR money… it is God’s and we are stewards to use it for the benefit of other people. 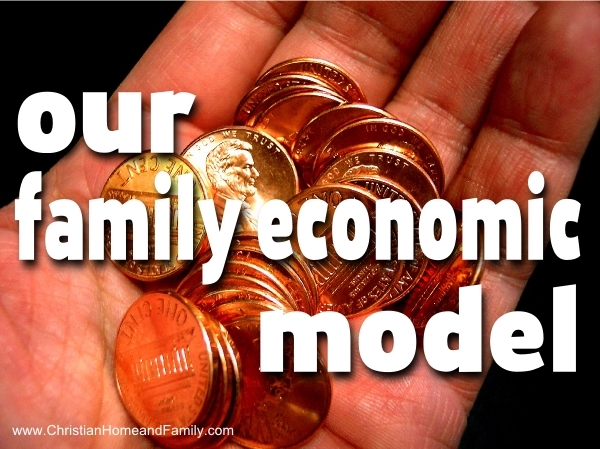 I’m curious what you think about this family economic idea… share your thoughts below! Very intriguing. Thanks for sharing. I think you are right in the way we train our kids. I’ve never thought this out this fully before, but it seems scriptural and wise. I have considered something like this but not officially launched “profit sharing” 🙂 I do know that when we had an emergency vehicle repair our kids were the only ones with cash and paid for it. They were willing and happy. This has gotten sticky with teenagers when hubby or I say “while your living under my roof you will . . . “. They consider themselves a serious share holder!!!! and think they deserve a vote . Deborah. YAY! Your family is living out the humble, generous example I was writing about. I applaud you for leading them in that direction! The other issue you raise is indeed “sticky”… parental authority and ultimate determination for the family (under God) doesn’t vanish simply because of the “shareholders” (I like that phrase, by the way) stake in things around the household. The same humble attitude that enables them to give is what needs to be emphasized regarding the roles the LORD has established in the home. Yes, they are able to contribute and it’s also needed at times. But God has made the parents the parents. They are still the ones responsible for the ultimate decisions and directions the family takes.